The Asian Pacific Fund today announced the recipients of its first annual Chang-Lin Tien Education Leadership Awards, recognizing Sung-Mo "Steve" Kang, dean of the Baskin School of Engineering at the University of California, Santa Cruz, and Belle W. Y. Wei, dean of the College of Engineering at San Jose State University, for their professional accomplishments and leadership qualities. The honorees will each receive an unrestricted grant of $10,000. The award honors the legacy of Chang-Lin Tien, the first Asian American to head a major American research university, and was created to inspire more Asian Americans to aspire to this level of leadership. The program will support the professional development and advancement of Asian American leaders in higher education, an essential resource for our country's global competitiveness. Tien served as chancellor of UC Berkeley from 1990 to 1997. During his tenure, he strengthened undergraduate education, fostered diversity on the Berkeley campus, and raised nearly $1 billion for UC Berkeley. Acclaimed as a teacher, scientist, administrator, and fundraiser, Tien was admired by many students and faculty members. "With this award, we want to not only honor these scholars and administrators, but to inform the Asian American community of a vision and career path they might not have considered," said Emerald Yeh, Asian Pacific board member. "We are looking for future 'Dr. Tiens.'" 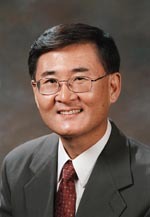 Kang was appointed dean of UCSC's Baskin School of Engineering in 2001. During his tenure, he has significantly increased the national visibility of the school and secured resources that doubled the faculty size and quadrupled sponsored research funding. "All universities are preparing young people for careers, but it is crucial that our education prepare them for the real world, the global economy, a world which is becoming flat," Kang said. "Diversity in leadership is enormously important and essential to higher education; we would not be as effective otherwise." Before coming to UCSC, Kang was head of the Department of Electrical and Computer Engineering at the University of Illinois at Urbana-Champaign. He is a fellow of the Institute of Electrical and Electronics Engineers (IEEE), the Association for Computing Machinery (ACM), and the American Association for the Advancement of Science (AAAS), and a foreign member of the National Academy of Engineering of Korea. He has served as president of the Silicon Valley Engineering Council and president of the IEEE Circuits and Systems Society, and he was the founding editor-in-chief of the IEEE Transactions on Very Large Scale Systems. Kang has received numerous honors, including the Mac Van Valkenburg Award of the IEEE Circuits and Systems Society, the UC Berkeley Outstanding Alumnus Award in Electrical Engineering, the IEEE Third Millennium Medal, and the SRC Technical Excellence Award. He received a B.S. from Fairleigh Dickinson University, an M.S. from the State University of New York at Buffalo, and a Ph.D. from UC Berkeley. The Asian Pacific Fund is a community foundation established in 1993 to improve the well-being of all Asians in the Bay Area. The fund encourages Asian Americans to be involved in the community and to give back. The fund connects donors to pressing community needs and also works with more than 80 local organizations that provide vital services to the diverse Asian American community. Since 1993, the Asian Pacific Fund has distributed nearly $3 million in grants and awards. Chang-Lin Tien was a founding member of its Board of Directors. More information about the awards is available on the web at http://www.asianpacificfund.org/resources/press.shtml. Note to reporters: You may contact Kang at (831) 459-4877 or kang@soe.ucsc.edu.